It's been called ‘The World's most Dangerous Footpath' and the ‘One of The World's Scariest Hikes'. 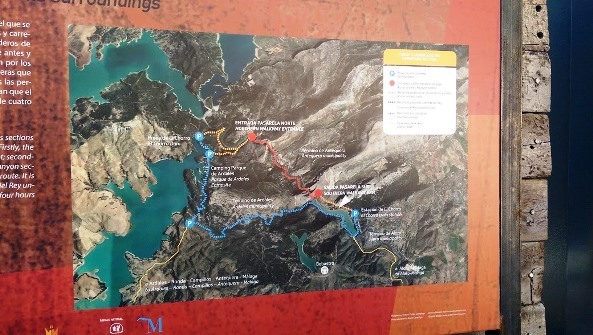 But after the Caminito del Rey reopened in 2015 following a 4 year restoration project it is now much more of a scenic walk than the terrifying trek of years gone by. The route is around 7km long and the terrain is made up of pathways through forest and woodland. 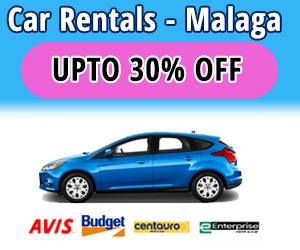 But the majority of the route is on a very secure wooden platform firmly attached to the steep sides of the El Chorro gorge in the Guadalhorce valley of Malaga. Still not convinced it's safe enough??? If my ‘terrified of heights' husband can do this trek, anyone can. 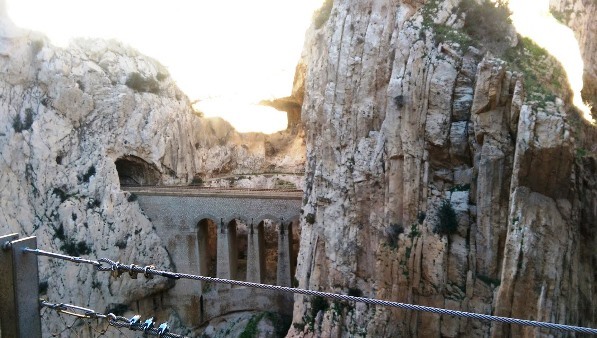 Getting to the Caminito del Rey is easy, around an hour in-land from Malaga by car or by train from Malaga's Maria Zambrano station to El Chorro. The train journey is direct, fast and cheap at just €4.85 for a one way ticket taking just 42 minutes direct. Several trains run throughout the day every day so be sure to coincide your train time with the time of your walk. 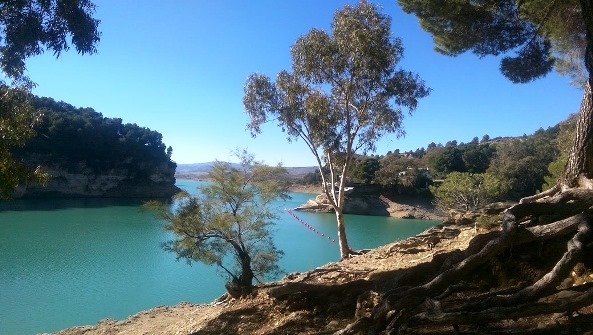 Tourists and locals have been coming to the area around the Caminito for years, especially in summer time when the turquoise reservoirs offer much needed respite from the hot sun. There are also water sports including a giant inflatable water park on the lake from June to September. There are plenty quaint little campsites, b&b's and guest houses in the area known as the Guadalhorce valley. The landscape is unique, breathtaking in fact and its all just so peaceful and calm. 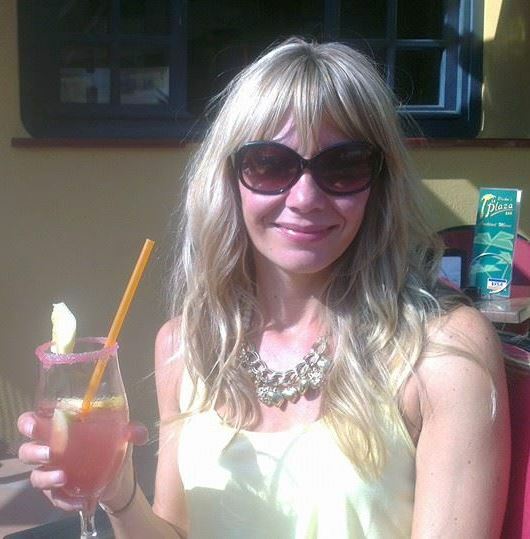 Spaces are limited for the Caminito del Rey for safety reasons and they only allow around 50 people every half hour. Slots are released in 3 or 4 month batches and weekends get booked up quickly so there's no point in just turning up hoping to get a slot. You really must book ahead. Booking is easy, just go to the calendar on the official site, choose your date and time and select the number of tickets you want. Don't forget to add the 1.55 euro bus fare, I'll explain why a bit later. Pay with a credit card and print off the confirmation e-mail to take with you. We finally did the walk on a sunny but cold Saturday afternoon in December after our previous booking a year earlier was aborted when my daughter woke up covered in chicken pox spots that morning. By the way, if you can’t make it for any reason, they don’t offer refunds or alternative dates. It’s tough luck basically as we found out after we were a ‘no show’ the first time. Weather in Ardales, as its in land can be a few degrees cooler in winter than down on the coast and in summer expect it to be hotter, so be sure to check the forecast. On the day of our walk temperatures in Malaga were 16 degrees but only 12 degrees in Ardales that day. I was glad I threw an extra layer into the boot of the car just before we set off because with the blustery wind it felt much colder. Before I get on to parking, I should mention that the walk is linear and therefore when you book tickets you must book the 15 minute bus journey back. It only costs an extra €1.55 pp and is well worth it otherwise you are pretty much stranded at the end of the walk if you don’t book it. You can book the bus at the same time you book your entrance ticket. 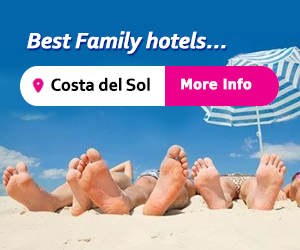 Once you select your date and time, choose ‘Entrada general + Autobus', the price you pay per person will be 11.55 euros. So there are two ways to do this, the most logical thing to do is this…drive to the North entrance, park your car and start the walk through the entrance tunnel. When you finish the walk at the other side hop on the bus outside the train station. This is the South end and it takes you right back to your car where you started. Or if you give yourself plenty of time before your allotted time slot, park at the south end which is where you will end the walk, take the bus to the north/start that way when you finish the walk at the south end you are back at your car…confused??? We chose the first option as we wanted to grab a bite to eat before starting the walk which was scheduled for 2pm, and knew there were some restaurants at the north entrance. 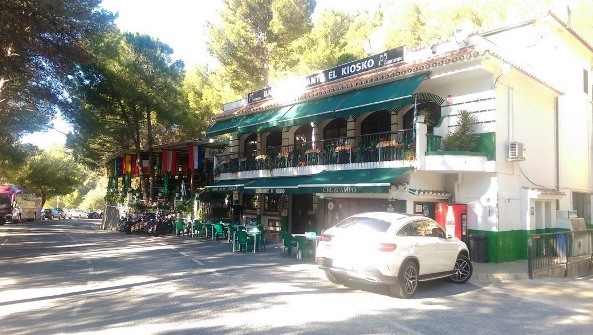 There is a restaurant on the roadside facing the lake called El Kiosko, you can’t miss it. 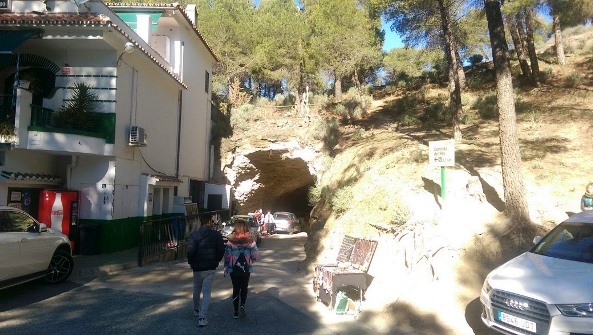 In fact you should look out for it as next to the restaurant is a little tunnel which you need to go through to start the Caminito del Rey. Restaurant El Kiosko & place to pick up snacks at the North entrance. 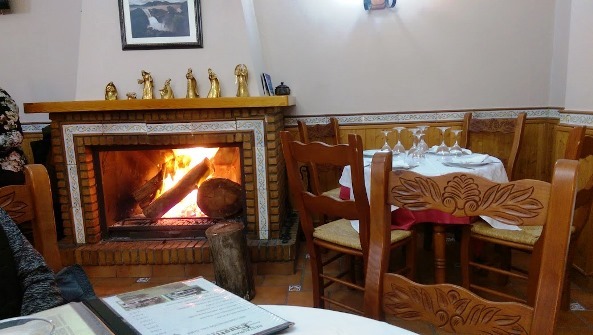 We arrived about 12.30pm and ventured upstairs at El Kiosko where they had a huge open fire so we grabbed a table right next to it and ordered. Portions were huge and we found it a bit much before embarking on a 7k hike. There is a snack bar downstairs and also a grab and go type counter where you can pick up supplies like water, canned drinks, snack bars etc to take with you. There are also toilets downstairs at the entrance to the tunnel. 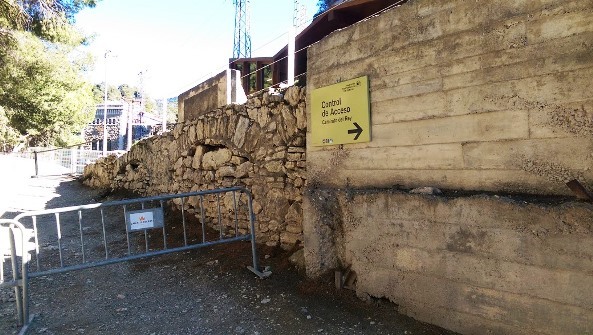 From this point (the tunnel), you still need to allow yourself 30 minutes before your time slot as this is NOT the start of the Caminito del Rey. It’s a 2.5 km scenic walk through forest to reach the starting point which will take 30 minutes at least. Once at the starting point there were already loads of people waiting and there are staff to check your tickets, give you helmets and put you in the correct group. There are a lot of people that are part of guided tours which you can also book through the website, the tours are in English and Spanish. Next they separate people into English and Spanish speakers for a brief safety instruction where the guide told us to allow around 2.5 hours to complete the walk, then you are off on your way. Almost immediately we came to a stretch of the route where the footpath changes to wooden slats secured on top of steel rods which are pinned into the side of the mountain. There’a a mesh fence and handrail about waist high and most of this is suspended around 100 feet up. It was only at this point I realised my husband of 12 years or so was actually really terrified of heights, this was real proper fear written all over his face. Obviously I laughed and told him it was 100% safe and to get on with it as we had another 5km to go, we had come too far to turn back. The scenery along the route is amazing, my husband missed out on most of it because he could barely look up or down. The vultures, buzzards and eagles circling above are ever present and I wondered if they were there waiting patiently for victims to fall. As mentioned, the footpath fell into disrepair years ago and was closed in 2000 as it was so dangerous. You can actually see the original path complete with holes, rusty metal poles and huge sections missing right below as you walk the new pathway. 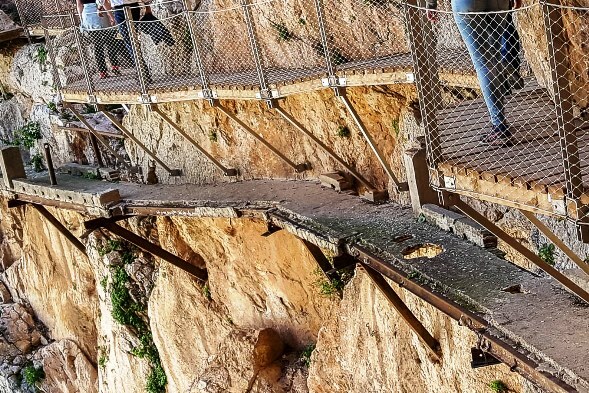 Terrifying to think adrenaline junkies attempted this walk while it was in disrepair despite the €6000 fine not to mention the huge risk involved. Memorials are displayed to acknowledge 4 of the climbers that lost their life…. No fear now though, It is completely safe once again and very well organised from start to finish. About 2km from the end as the path snakes around a bend it reaches a crucial point where walkers cross from one side of the gorge to the other. The only way to do this is by walking over a suspended bridge about 10 metres in length and hundreds of metres high known as ‘The Walkway of Death'. I loved this part, it was such a great opportunity to take photos and video from all angles. Suspended mid air between the rock face with absolutely nothing interrupting your view. Once safely on the other side and during the final km stretch, the Caminito takes a dramatic path along a very straight and narrow cliff, then finally comes back to solid ground for the final few hundred metres. There are some information boards explaining how and when it was built and about the restoration, stop and look at them as they helps you appreciate the almost impossible task of its construction. 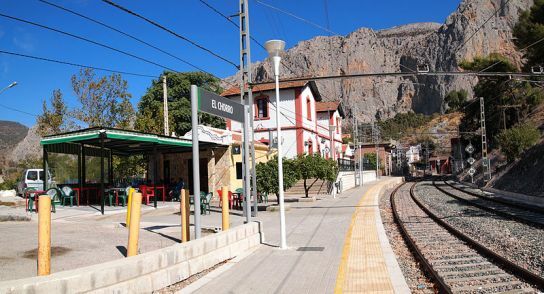 All that is left to do is follow the signs for the El Chorro train station, its easy as its a straight road. Pass the car park and a camp site, then you'll see the train station on the left with a handy little bar to grab a quick drink. Next to the station is where you pick up the bus to take you back to the start. There were already people waiting when we arrived and a bus had just pulled in however there was no room for us so we had to wait 30 minutes for the next one. If you have a little bit of time a fantastic place to grab a bite to eat and a drink is La Garganta Hotel and restaurant right opposite the bus stop. 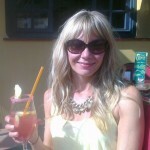 Walk round to the outside terrace for direct views of the Caminito and a well earned drink. I really wish I had known about this hotel before our visit as it's the perfect location to the Caminito del Rey to stay over for a night or two and explore the area more. It has so much rustic charm and gorgeous views over the lake and the final stretch of the Caminito del Rey. The bus was punctual and journey back to the car and north entrance took only about 15 minutes. The bus takes you just past the car park and drops you right at El Kiosko and the entrance tunnel to the start of the route. All in all the walk took a total us of 2 hours 30 minutes, including the short walk leading to the start of the Caminito del Rey. If I could summarise, this walk is as close you will ever come to feeling like you are part of a Indiana Jones movie. The clear glass viewing platform, if you dare to step onto it is a reminder of how unnaturally high up you are, even more apparent if you are afraid of heights. 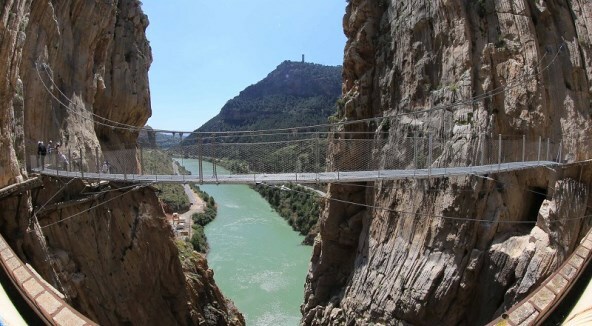 It is unlike any other place you will ever go to and eve though some say it has lost its edge, if you are an adrenaline junkie then I believe you cannot come to the Malaga region and not walk the Caminito del Rey. I will go there next week with my boyfriend, I think I am like your husband, but I hope I will be able to overcome my fear and enjoy Caminito Del Rey! Hi. My friend is actually terrified of heights and almost didn’t go despite having booked it weeks in advance. He is so glad he did it, you will be too I hope and you’ll be super proud of yourself if you do! If you get the bus back to to the North entrance or starting point then there is a huge beautiful lake to explore, there are some water sports too depending on the time of year. Also many cafes with beautiful views across the lake if you feel like just resting and taking in the scenery. At the south end, where you will finish the walk, pop into the reception of La Garganta hotel, they will give you some information on other walks around the area and the lake there. There’s plenty to do to fill the rest of your day. Enjoy and you never know you might get over your fear of heights!